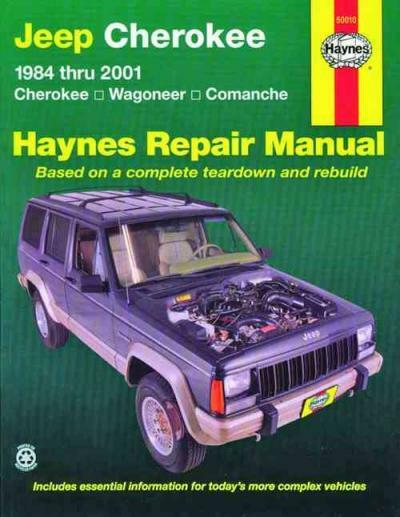 Jeep Cherokee, Wagoneer & Comanche 1984 - 2001 Haynes Owners Service & Repair Manual covers: the Jeep Cherokee, Wagoneer & Comanche. Does NOT include Grand Wagoneer or Diesel Engined variants. The Jeep Cherokee (XJ) are a concise SUV which was manufactured and advertised by Jeep from 1984 to 2001. Sharing the name for the earliest full size SJ design, but without a traditional body-on-frame chassis, the XJ instead showcased a light-weight unibody build, predecessor into modern-day sport energy vehicle (SUV). The XJ spawned competition as other automakers began to notice that this Jeep design started changing regular cars. In addition it started initially to supplant the role of this facility wagon and "transformed from vehicle to limousine in eyes of countless residential district holders." The XJ was a "significant website link into the advancement of this 4x4." Integrated Toledo, Ohio, in Beijing, China, in Ferreyra, Argentina, in Cairo, Egypt, plus Valencia, Venezuela, the XJ provided the technical foundation the MJ-series Jeep Comanche pickup truck. Noted automotive journalist Robert Cumberford, writing for car, called the Jeep XJ one of the 20 biggest cars ever --- because of its design, and "possibly top SUV model of in history, it's the paradigmatic model that more developers posses since aspired". The XJ has also been chosen in 2011 as one of "10 vehicles that refuse to perish" by Kiplinger. Styles of this compact-size XJ Cherokee day to 1978 when a group of United states Motors (AMC) and Renault designers drew several sketches. Clay products were based on the after that present full size SJ Cherokee. Early sketches of XJ Cherokee have a European influence, & most of styling cues were done-by AMC engineers in direction of Richard A. Teague, vice-president of build. Noticing that General engines is establishing a new two-door S-10-based Blazer, AMC made a decision to establish a totally new four-door design in addition to a two-door variation. American Motors' vice president of manufacturing, Roy Lunn, designed what exactly is known as the "Quadra-Link" suspension, that minimal rollovers. Renault's Franois Castaing developed the drivetrain utilizing a much small engine than normally found in 4WD vehicles and paid off the weight associated with the new-model. It "is noteworthy as earliest nonmilitary 4x4 with unibody construction." The unconventional design improved XJ's durability and off-road ability that fundamentally claimed more than many critics, even those brands utilizing the early underpowered GM machines. The XJ is explained "as very first smaller crossover SUV within the U.S.," with "plenty associated with the Jeep toughness (and a straight-six system) integrated." The style and marketplace positioning associated with XJ, combined with the AMC Eagle basically "foreshadowed the car-based crossover utility-vehicle craze." Even though the XJ designs had just become introduced, AMC rapidly began development of their successor. To vie against their much bigger competitors, the littlest U.S. automaker produced a company process that has become generally "product lifecycle administration" (PLM) to speed up their items developing processes. By 1985, development and engineering was according to computer-aided build (CAD) computer software methods while latest techniques saved all images and documents in a central database. The pioneering PLM is therefore effective that after Chrysler purchased AMC in 1987, it broadened the system throughout its own enterprise. British TV presenter and motoring specialist Quentin Willson described the XJ Jeep as "a real 4x4 symbol" plus one of "few undoubtedly great cars... which, despite becoming left out by new versions, however promote fresh and immediate options. Cars which be much more appropriate the old they see." Dependability of Diesel versions has been not so good, plenty of issue at the cylinder mind and block connections has-been confirmed (usually around 200.000 km), often the prechamber # 3 current splits, requiring a mind change, especially on Jeeps because a higher mass for this engine. United states engines dedicated three-years into the growth of a four-cylinder motor. The brand new motor ended up being built to incorporate AMC's established spacing amongst the cylinder bores so your tooling stayed similar. The place of various other significant components, such as the provider, oils filter, and starter were additionally held equivalent to in order to utilize the device tools the AMC straight-6 system. Based on Jeep's primary professional, Roy Lunn, "unlike more engines on the market had not been made for passenger cars then adjusted for trucks. We specifically created it with your Jeep motors and Eagle in your mind. This is why that results and durability were of such prime consideration through the very beginning." While some of elements are compatible amongst the AMC 258 cubic inches six-cylinder and new motor, the four-cylinder had not been a cut down form of the major six. Noted Roy Lunn, "there are several typical section, but the 4-cylinder includes numerous special items such a unique electronics methods. It also has a shorter stroke and bigger bore. The valves become larger therefore the pistons tend to be latest." Roy Lunn recalled: "We wanted as much displacement - for power and torque - possible within the confines of bore centers associated with the tooling. The only real parameter we're able to manipulate substantially was swing. Therefore we chosen the biggest bore and swing in order to get 2.5 Liters." The AMC 150/2.5 L motor features a bore of 3.875 in (98.4 mm) and a swing of 3.1875 in (80.96 mm). The head features a combustion chamber and port build which was later applied to the 4.0 L --- the 2.5 L I-4 head destroyed two cylinders in its center, juxtaposed into six-cylinder machines. The 2.5 engine additionally features five main bearings and eight overhead valves. As opposed to the standard AMC bell housing bolt design, AMC/Jeep engineers adopted the overall engines small V6 and four-cylinder bolt design (popular with GM's transverse-mounted powerplants) for his or her brand new motor, because the brand-new AMC 2.5 changed the four-cylinder machines that were bought from GM; and because AMC continued purchase the 2.8 L V6 from GM before the 4.0 L I6 is introduced in 1987. The four-cylinder and V6 provided the same drivetrain equipment, whereas stronger transmissions were required for the newest 4.0 L.
The AMC I4 initially appeared in 1984 model 12 months utilizing the newer XJ Cherokee. In 1986 the top went under a modification, the head bolts are increasing from 7/16 to 1/2 inch. From 1997 to 2002 it was advertised given that "Power-Tech I4". It absolutely was created through 2002 the Jeep Wrangler, and for the Dodge Dakota pickup that also featured the AMC/Jeep created four-cylinder as its standard system from 1996 through 2002. This lightweight engine is comparable to its "big bro" 4.0 L, and though maybe not powerful, its durable with no reliability issues. Result the ultimate year had been 121 hp (90 kW; 123 PS) at 5400 rpm and 145 lb*ft (197 N*m) of torque at 3250 rpm making use of sequential multiple-port gasoline injection (MPFI). For contrast, the 258 I6 provided 112 hp (84 kW; 114 PS) at 3200 rpm and 210 lb*ft (280 N*m) of torque at 2000 rpm in its last season because of the computer-controlled carburetor. For a long time, the engine ended up being detuned for the Wrangler; from about 1992-1995, they produced 130 hp (97 kW; 132 PS) and 149 lb*ft (202 N*m) of torque with 9.2:1 compression when you look at the Cherokee and Comanche. The 242 cu in (4 L) engine originated by AMC within 26 period making use of most off the shelf equipment while featuring, amongst others, additional power, enhanced burning chamber, interface setup, and cam profile. The sum total pounds of brand new system is 483 pounds (219.1 kg), only 1 lb significantly more than the 258 six despite their thicker elements and components. For example, the cast aluminum valve address featured 15 bolts, the industry's many, to quickly attain an optimistic seal. The latest system, that has been launched in 1986 for 1987 model 12 months, ended up being an additional advancement of AMC's 258 six. It have a 3.875 in (98.4 mm) bore and a 3.414 in (86.7 mm) stroke offering it a displacement of 241.6 cu in (3,959 cc). Connecting rod length was 6.125" - similar to the discontinued 199 that has been eliminated in 1970. The 4.0 is one of AMC's best-known engines. It had been certainly one of four AMC machines held in production whenever Chrysler bought AMC in 1987. Chrysler engineers proceeded to improve the engine to cut back sound, vibration, and harshness. The very last within the distinct the AMC inline sixes, the 4.0 is undoubtedly one of the best Chrysler 4x4 off-road machines. A Motor Trend long-lasting test of a 1997 Cherokee XJ mentioned "this long-lived OHV powerplant possess a reputation to get somebody in which they should go" plus "much appreciate indicated by people for torquey 4.0-liter/190-horsepower inline six." The system is known for durability, and may often go more than 300,000 kilometers (482,803 kilometer) without rebuilding. There are numerous aftermarket parts available. When launched, the block-mounted oil filter check device ended up being eradicated regarding the 4.0 (combined with 2.5 and 4.2s produced after September 1986) when AMC designers standardised their particular oils filters. The pre-1987 motors have an oils filter adapter with 3/4 (cylinder block end) and 13/16 threads (that used a GM oil filter typical to Buick, Oldsmobile, Pontiac, and Cadillac V8 motors) while the 1987-06 motors had been originally fitted with a 20 mm metric bond filter (later revised in 1991 for the typical 3/4 threaded Mopar and Ford V8 oils filter; the oils filter adapter is redesigned in which the oil filter lies 90 levels offset adjacent to the starter engine - a Ford V8 oil filter can be used instead of the quick filter increasing oiling capability). Initial 4.0 motors in 1987 have a RENIX (Renault/Bendix) motor management program considered rather higher level for their time. A knock sensor let the ECU to manage spark advance in response to gasoline octane and engine load. Unfortunately, you will find couple of scan resources effective at interfacing with the system to pull diagnostics codes. RENIX methods likewise have no permanent memory for diagnostics codes therefore making the analysis of intermittent trouble harder. The 1987 RENIX 4.0 made 173 hp (129 kW; 175 PS) and 220 lb*ft (300 N*m). In 1988, the 4.0 obtained higher streaming gasoline injectors, increasing result to 177 hp (132 kW; 179 PS) and 224 lb*ft (304 N*m)---more power than some configurations of the Ford 302, Chevrolet 305, and Chrysler 318 8-cylinder motors, and more than just about any for the Japanese 6-cylinder vehicle engines, but with similar or exceptional gas economic climate. In 1991, a Chrysler MPI gas shot program replaced the RENIX system, and also the intake harbors had been raised about .125 in (3.2 mm) for an improved entry radius. Chrysler furthermore enlarged the throttle human anatomy and redesigned the consumption and fatigue manifolds for more effectiveness, therefore the fuel injectors are changed with greater flow products. Camshaft timing has also been changed. The net consequences is an engine that made 190 hp (142 kW; 193 PS) and 225 lb*ft (305 N*m). Badging of many Jeeps loaded with this motor study "4.0 Litre EXTREME OUTPUT." The new cam profile along with altered computer programming eradicated the need for an EGR device and knock sensor, but made the system more responsive to modifications, particularly where emissions are concerned. The OEM gasoline injectors used in combination with the Mopar MPI program (produced by Siemens) being recognized to leak fuel specifically with OBDII where plugged catalytic converters are typical which will throws a P0420 signal - one adjustment could be the usage of factory Bosch gas injectors from a 1995/96 Dodge Neon that'll create faster speed and build extra horse power. Small adjustment were meant to the cylinder head for 1995 design seasons. In 1996, the motor block is redesigned for better strength. The new block have additional webbing and a stud girdle for additional rigidity associated with the crankshaft primary bearings. Machines set up in 1999 Grand Cherokees transported the "PowerTech" name that had been used intermittently in prior years and on various other Chrysler vehicle and SUV machines. The name was later offered to 4.0s in more Jeep brands which used the motor, the Cherokee and Wrangler. The cylinder mind had been once more altered for 2000 design seasons to an even more emissions-friendly build. This mind was designated as "0331" in the casting number. Early 0331 minds are inclined to breaking, causing coolant to contaminate the oils, that may lead to catastrophic motor failure. The head cracks within the center between #3 and number 4 cylinders. The break is generally discernible utilizing the valve cover eliminated as a "milky" tan line. This disorder is generally discovered before catastrophic system troubles, but can lead truth be told there or even corrected regularly. The casting had been fixed in middle to belated 2001, however the same casting quantity is retained. The "fixed" minds need "TUPY" cast when you look at the center where splits familiar with happen. Also latest when it comes to 2000 design 12 months, had been the distributorless, coil on connect ignition program. Option code: ERH. The 4.0 engine was discontinued after the 2006 design year, changed inside redesigned 2007 JK Jeep Wrangler by Chrysler's 3.8 L OHV V6, which originated in the business's minivans. The 4.0 engine was also produced in China, where a slightly changed version of the XJ Jeep Cherokee with 2.5 and 4.0 engines had been created alongside the Chinese-produced WJ Grand Cherokee since 2006. The XJ Cherokee introduced for the 1984 model year had been 1st Jeep with a ladder-boxed chassis integrated into a single monocoque unit as opposed to the traditional individual body-on-frame construction. The look ended up being rigid and durable, "yet perfectly lightweight, Uniframe allowed outstanding results even with AMC's brand-new 2.5-liter/150-cubic-inch four-cylinder engine." Both two- and four-door versions associated with the XJ Cherokee had been provided throughout their life, each having the identical track and wheelbase measurements. Two-door products, however, obtained longer doors and front chairs that may fold toward assist in back passenger entry and exit. It was in addition to extended-length rear windows that would not start, although an optional backside vent screen was on some versions. a variation on Cherokee from 1984 to 1990 is the Jeep Wagoneer. We were holding unrelated on similarly known as full-sized Grand Wagoneer systems which had transported the Wagoneer title before this point. The small XJ Wagoneer had been available in two trim amounts: the "Wagoneer" while the "Wagoneer Limited". Both Wagoneers were recognized from the Cherokee designs in 1984 and 1985 by a somewhat different grille and an inferior "Jeep" emblem offset to your motorist's part. Beginning in 1986, they altered to two vertically piled reasonable and highest beam headights (a.k.a. "spider eyes") with forward change indicators moved behind the grille. The Wagoneer restricted came with vinyl lumber trim on the edges and leather-based chairs embossed with "Limited". This variation ended up being the first to be offered in European countries; it absolutely was launched in 1992 in some markets, 1993 when it comes to uk. Early models had the 4.0-liter/242-cubic-inch inline six-cylinder engine best; the 2.5-liter (150 CID) motor would not arrive in European countries until 1995. The XJ firewall had been notched to accommodate the longer 4.0 L system. In mid-1985, a two-wheel-drive type of the Cherokee is added to the lineup. This marked the first occasion any Jeep goods is provided with two-wheel drive since 1967, and had been carried out in the hopes of attracting some more buyers which would not want (or wish to pay money for) four-wheel drive. Whenever XJ Cherokee-based Comanche (MJ) truck is introduced, it had been additionally obtainable in two- and four-wheel drive. This new two-wheel-drive models provided the leading suspension system (from the track club, controls hands, ball bones) with four-wheel-drive products. Jeep merely made use of one axle pipe from hub to hub with no differential between, causing a cheap front suspension. For 1996, partly to conform to brand new U.S. OBD-II fatigue and evaporative emissions regulations, the motor control program had been enhanced to Chrysler's then-new "JTEC" PCM. This included along side it advantages of improving dependability and easing diagnostics. United states engines's small XJ Cherokee was to become changed by a and larger design referred to as ZJ (later called the Jeep Grand Cherokee when launched in 1993) which was under developing by AMC. However, the smaller model's continuing popularity triggered Chrysler professionals to reconsider this choice, and even though the ZJ products were launched in 1993, the XJ designs were retained until 2001. The Jeep XJ possess stayed a well known option by off-roading lovers because potent off-roading ability in inventory form. Their popularity possess led to powerful ongoing aftermarket help in the shape of a multitude of goods. After 13 years of manufacturing, 1997 spotted the Cherokee obtain updated outside and interior styling. The two- and four-door body remained in manufacturing, getting a metallic liftgate (replacing the fiberglass one put formerly), restyled taillights, further synthetic molding along the doors, also a brand new forward header panel that featured additional aerodynamic styling. The free tire had been moved from a rear exterior bumper mount to an interior area due to de-contenting the rear bumper. An innovative new, unique extra tire service is designed by Peter Gruich while doing work for Jeep Special software that used the trailer hitch club and an original pivot bracket and though it absolutely was truly the only outside extra tire company to pass through the total Jeep durability test, it absolutely was maybe not provided available. The inside is similarly updated with an all-new build and tool panel featuring initial blow-molded symmetrical instrument panel retainer structure. This tool panel featured a distinctive cluster/airbag bracket designed by Peter Gruich that permitted the interchange of the two components to allow the vehicle become marketed when you look at the right-hand and left-hand drive areas with both driver and passenger airbags. A stiffer unibody frame brought modifications to sound, vibration, and harshness (NVH) dimensions. Furthermore contributing to NVH improvements are latest door seals that paid off wind sound at greater speeds. In the 1999 design seasons, automobiles using the 4.0 L motor obtained a modified consumption manifold. This was done to greatly help counteract modest exhaust porting regarding the newest casting of cylinder minds, that was complete to fulfill considerably stringent emissions controls legislation. Both four- and six-cylinder motors are supplied through the 2000 design year, though just the straight-six had been available in 2001. The 2000 and 2001 model ages, all six-cylinder XJs gotten a distributorless ignition system utilizing coil-on-plug ignition changing the "standard" program previously used; in conjunction with best exhaust porting together with newer intake manifolds, this offered a minor escalation in power within the previous brands. Transmission, axle, and transfer circumstances choices are carried more than from earlier brands. However, significant adjustment had been underway with a brand new professional, Wolfgang Bernhard, who was simply called a "cost-slasher" nicknamed "whirlwind", which came from Mercedes-Benz to show around Chrysler. "One of the first techniques Bernhard made as he came to Chrysler in 2000 would be to assist eliminate the Jeep Cherokee, an aging, notably bland SUV." Hence, the (XJ) Cherokee line was changed in 2002 by the Jeep freedom (KJ), even though it try retained the "Cherokee" nameplate in most international areas. The Cherokee (XJ) stays a favorite car among off-roading enthusiasts. Its build is mentioned as one of the greatest of all time. Preferred Mechanics detailed the XJ as one of "the 25 biggest boxy automobiles ever". When (XJ) Cherokee manufacturing finished in mid-2001, the part of the Toledo Southern system Plant specialized in its manufacturing is torn down. Base - 1984--1992 / SE - 1993-2001 included: vinyl or fabric furniture, full-faced metal wheels, and have always been broadcast with two speakers. Wagoneer - 1984--1990 included: ribbed fabric upholstery with leather-based trim, imitation maple-wood inside accents with wood laminate exterior decals, alloy wheels, AM/FM broadcast with cassette player and four speakers, infrared (single-button) remote keyless entry for 1990 model year, overhead console for 1990 design seasons, twin energy seats, and air cooling. Briarwood - 1991--1992 (succeeded Wagoneer) included: leather-and-vinyl furniture, faux maple-wood indoor accents with wood laminate outdoor decals, lace-spoke wheels, AM/FM broadcast with cassette athlete and six Jensen AccuSound speakers, infrared (single-button) isolated keyless entry, overhead console, twin energy seating, and an ac. Pioneer - 1984--1990 included: cloth plaid-pattern upholstery, metal rims and in the morning broadcast with two speakers. Pioneer Olympic version - 1988 included: cloth upholstery, AM/FM radio with two speakers, and an ac. Main - 1984--1990 included: fabric plaid-pattern furniture, and AM/FM broadcast with two speakers. Athletics - 1988--2001 included: cloth-and-vinyl furniture, AM/FM broadcast with four speakers, full-faced metal or optional alloy wheels, recommended infrared (single-button) (1988-1996) or radio frequency (dual-button) (1997-2001) keyless entry (if designed with power hair), and an ac. Nation - 1993--1997 included: two-tone paint just like "Laredo" with enhanced color-keyed pinstripe and the choice for "wine" gold along side silver as accent options, the replacement of several interior, formerly chrome accents with level black (Base and athletics models, and, starting in 1993 design seasons), cloth-and-vinyl ("luggage fabric") furniture with the option for leather (excluding 1993 model 12 months), faux mahogany-wood interior accents, lace-spoke tires, AM/FM radio with cassette player and four speakers using option for six Jensen AccuSound speakers, optional overhead system (excluding 1993 model year), infrared (dual-button) (1993-1996) or radio-frequency (dual-button) (1997) isolated keyless entry (if designed with energy hair), optional twin energy chairs, and an air conditioning unit. Classic - 1996, 1998--2001 included: monotone paint color, cloth upholstery, alloy tires, AM/FM broadcast with cassette player and four speakers, infrared (dual-button) remote keyless entry, overhead system, and an air conditioning equipment. Brief - 1987-1992, 1998--2001 included: monotone paint, leather-and-vinyl furniture, sunlight roofing, color-keyed lace-spoke wheels, AM/FM radio with cassette athlete and six Jensen AccuSound speakers, infrared (single-button) remote keyless entry, overhead console, twin power seats, and an ac. Laredo - 1985--1992 included: chrome accenting, cloth plaid-pattern (1985-1987) or "luggage textile" (1988-1992) furniture because of the option of "Briarwood" style leather-and-vinyl chairs when it comes to 1992 model 12 months only, five-spoke alloy rims, AM/FM broadcast with four speakers and the option for six Jensen AccuSound speakers, infrared (single-button) isolated keyless entry (if loaded with power hair) optional expense system, optional double power seating, and an ac. Freedom - 2000 included: special badging, SE look team on recreation human anatomy, 16" Ultrastar alloy wheels(borrowed from 1998 5.9L ZJ), AM/FM radio with cassette, radio frequency isolated keyless entry and an atmosphere conditioner. Based on the Sport trim levels. For sale in 2wd or 4wd. 60th Anniversary - 2001 included: unique badges, special floor mats, monotone paint shade, 16" alloy wheels, AM/FM radio with cassette, radio-frequency remote keyless entry and an atmosphere conditioner. In line with the Sport trim levels. All transfer instances used on the Cherokee had been chain-driven with aluminium housings. Command-Trac is standard on XJ models designed with 4WD. The Jeep XJ uses front and back solid (live) axles in the place of independent front and back axles. This setup permits the XJ to possess better off road capability and performance at the cost of some on-road convenience and driveability. Mid-1985 and later two-wheel drive versions used the same fundamental suspension system with one pipe linking axle concludes without differential. 3.07:1, handbook transmission, I6 engine. The Jeep XJ utilizes a coil springtime front suspension with a leaf spring rear suspension. The Quadra-Link front suspension design locates the axle with four leading controls arms to manage longitudinal activity and rotation about the horizontal axis (drive and braking effect), two over the axle as well as 2 below it. A panhard rod, also referred to as a track bar, is employed to discover the axle laterally. Two coil springs are sitting above the axle housing including two gas-charged shock absorbers. The suspension system used on motors using optional UpCountry package offered one inch of raise on the standard suspension system. A sway bar are useful to reduce human anatomy roll in turns. The XJ makes use of a leaf spring rear suspension. Each leaf pack contains four leaf springs with a hard and fast attention at the front end associated with the spring and a compression-style shackle powering the spring. Two gas-charged surprise absorbers may also be put, with a mild anti-sway/anti-roll club. The suspension system used on cars using the optional UpCountry package didn't use the trunk anti-sway/anti-roll bar and provided one-inch of lift throughout the standard suspension. New and used parts for 1984-01 Jeep Cherokee XJ vehicles. You can also find used Cherokee XJs for sale. Find great deals on eBay for jeep cherokee xj jeep cherokee sport. Shop with confidence. Find great deals on eBay for Jeep Cherokee XJ in Lift Kits & Parts. Shop with confidence. This week we’re taking a look back at the Jeep ® Cherokee XJ. It launched in 1984 and was produced through 2001 selling over 2.1 million units. Jeep Cherokee Forum - Off Roading, Modifications, and anything else Cherokee related!